Your entry door is the first thing your visitors see. To create the ultimate first impression we offer many styles from multiple manufacturers to make that first impression the best that it can be. Fiberglass, steel and real wood species with multiple grains to match the interior décor of your home. Sold panel entry doors or those with multiple sizes of glass lites are available. Choose from doors with insulating properties and low maintenance to fit your energy and long term care needs. Many different hardware finishes available. The best way to see which entry doors will work best for your home is to get a free in-home consultation, which you can schedule right now. 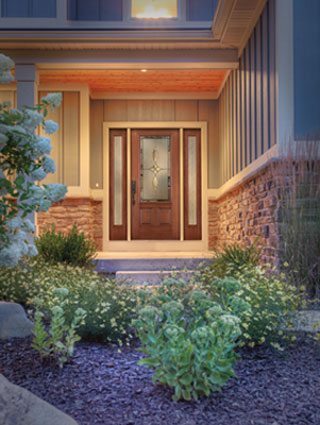 Our certified consultants will show you different designs from many different manufacturers so that you can choose the best entry doors for the price that fits your budget. If you’d like to take a look at entry door brochures from the manufacturers we represent just click on their logo below. . .